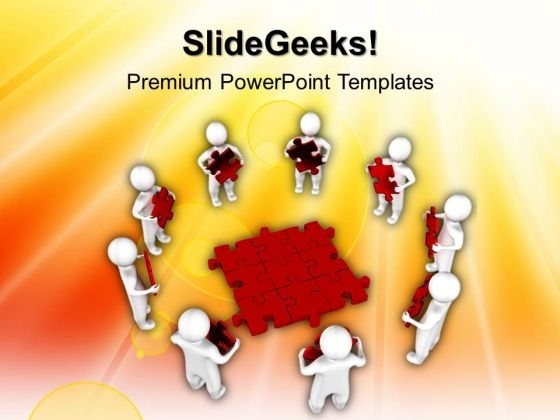 3D Men Holding Red Puzzles Teamwork PowerPoint Templates And PowerPoint Themes 1012-Develop competitive advantage with our above template which contains a diagram of 3d men forming a circle holding puzzle pieces in hands with nine jigsaw puzzles in center. This image represents the concept of finding a solution. This image has been conceived to enable you to emphatically communicate your ideas in your Business PPT presentations. The structure of our templates allows you to effectively highlight the key issues concerning the growth of your business.-3D Men Holding Red Puzzles Teamwork PowerPoint Templates And PowerPoint Themes 1012-This PowerPoint template can be used for presentations relating to-"Men holding a red puzzle pieces, puzzles or jigsaws, teamwork, business, people, success" Our 3d Men Holding Red Puzzles Teamwork PowerPoint Templates And PowerPoint Themes 1012 are very falcon like. They keep a sharp eye on the target. Create an effective checklist with our 3d Men Holding Red Puzzles Teamwork PowerPoint Templates And PowerPoint Themes 1012. Put all the ticks in the right place.